Finally, a Hillary Clinton conspiracy that doesn’t involve her being a Beltway Aileen Wuornos or suffering from the strain of flu from Stephen King’s The Stand. 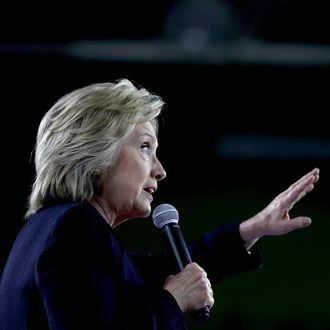 In a seemingly innocuous interview with Max Linsky on her campaign podcast With Her, the Democratic presidential nominee discussed how she decompresses during the race, which involves reading “novels, spy thrillers, mysteries, and biographies.” Says Clinton, “You know what I have started reading and it’s just hypnotic is the Neapolitan novels by Elena Ferrante. I had to stop myself so I read the first one. I could not stop reading it or thinking about it.” Hypnotic? Couldn’t stop thinking about it? Reading? Couple that with the Cut’s (extremely fake) theory that the Italian author wrote Hillary Clinton and Tim Kaine’s book Stronger Together, and you’ve got yourself a bona fide conspiracy theory on your hands. Is Elena Ferrante secretly manipulating Hillary Clinton’s every move through some kind of, uh, book mind control? Or is Hillary Clinton in actuality Elena Ferrante? And if she is, how did she find the time? Really, the woman does so much.